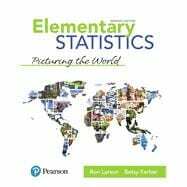 Elementary Statistics: Picturing the World makes statistics approachable with stepped-out instruction, extensive real-life examples and exercises, and a design that fits content for each page to make the material more digestible. The text’s combination of theory, pedagogy, and design helps students understand concepts and use statistics to describe and think about the world. The 7th Edition incorporates a thorough update of key features, examples, and exercises, as well as robust technology resources that include StatCrunch®, a new Tech Tips feature, and an Integrated Review version of the MyLab Statistics course. * Available at www.pearson.com/math-stats-resources and in MyLab Statistics.